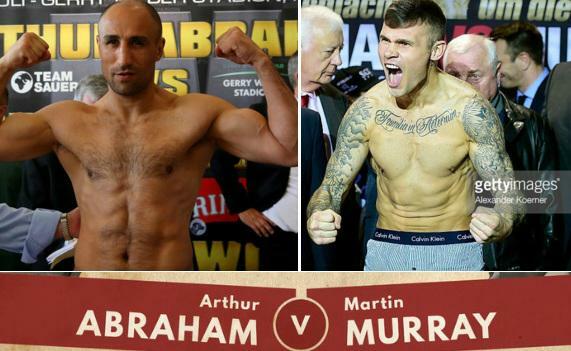 British boxer Martin Murray ended up on the losing side yet again this time against Arthur Abraham who showed experience and class inside the ring to edge out a split decision. Murray came in touching distance to win much awaited world title but he was left disappointed again with a split decision defeat. Judges scored the fight as 115-112, 116-111 and 112-115 and it could have gone either way. It was absolute devastating loss for Murray and its hard to think that he will get another chance of reclaiming world title after this defeat. Murray however was confident after the fight that he will continue to fight and hopes that show must go on. Another british fighter was in action on saturday night in Germany as Anthony Crolla defeated Darleys Perez to win his world title fight after returning from career threatening injury last year. Abraham will be defending his WBO super middleweight title against Martin Murray in front of possibly packed Tui Arena in Hannover, Germany. Arthur Abraham is a season vatern with over 12 years of experience an has been world champions twice in his career which stands at 43 wins in 47 fights with 4 losses. Martin Murray on the other hand has a very respectable career CV with the record 32 wins 2 losses and a draw. It will be Murray’s fourth attempt at world title fight. The fight card include another massive fight between Anthony Crolla vs Darleys Perez. The undercard fight will start around 9:40 pm uk time while the main event should get underway at around 11:20 pm uk time.